Presentation software to host your own game shows! Jeopardy! : Game Show Presentation Software for Windows | Host Your Own Game Show! | Great for the Classroom! | Great for Teambuilding! Match Game: Game Show Presentation Software for Windows | Host Your Own Game Show! | Great for the Classroom! | Great for Teambuilding! Easy Game Show Team Scoreboard for Windows | Host Your Own Game of "The Chase" | Great for Parties, Team Building or Twitch Streaming! Sale of the Century: Game Show Presentation Software for Windows | Host Your Own Game Show! | Great for Parties! | Great for Teambuilding! Press Your Luck (with Custom Board Configuration and Prizes): Game Show Presentation Software for Windows | Host Your Own Game Show! Hollywood Squares: Game Show Presentation Software for Windows | Host Your Own Game Show! | Great for the Classroom and for Team Building! Panel Quiz Attack 25: Game Show Presentation Software for Windows | Host Your Own Game Show! | Great for the Classroom or Teambuilding! Tic Tac Dough: Game Show Presentation Software for Windows | Host Your Own Game Show! | Great for the Classroom! | Great for Teambuilding! Joker's Wild: Game Show Presentation Software for Windows | Host Your Own Game Show! | Great for the Classroom! | Great for Teambuilding! Blockbusters: Game Show Presentation Software for Windows | Host Your Own Game Show at Home! | Great for Parties! 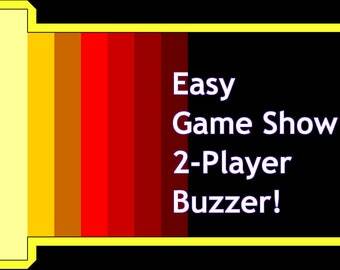 Easy 2-Player Game Show Buzzer | Host Your Own Game Show! | Great for "Family Feud" Style Games! | Great For Trivia Night! | Special Events! Concentration: Game Show Presentation Software for Windows | Host Your Own Game Show! | Great for the Classroom! | Great for Teambuilding! Easy "Countdown"-Style Clock and Scoreboard for Windows | Host Your Own Game Show! | Great for Parties, Team Building or Twitch Streaming! Easy "Double Dare"-Style Clock for Windows | Host Your Own Game Show! | Great for Parties, Team Building or for Twitch Streaming! Definition: Game Show Presentation Software for Windows | Host Your Own Game Show! | Great for the Classroom! | Great for Teambuilding! Easy Game Show 4-Player Scoreboard for Windows | Host Your Own Game Show! | Great for Parties, the Classroom or for Twitch Streaming! Easy Game Show Money Ladder for Windows | Host Your Own "Greed" Game Show! | Great for Parties, Team Building or for Twitch Streaming! Farkle: Game Show Presentation Software for Windows | Host Your Own Game Show! | Great for Parties! | Great for Twitch Streaming! Pointless Game Board: Presentation Software for Windows | Host Your Own Game Show at Home! | Great for Parties! | Great for Team Building! Greggo has never failed to deliver. His presentation software is amazing and fun to work with. I can't wait to debut my first game of Farkle on my Twitch channel using this! The art is mine. She has the button maker.